Distraction can be used by a character to mislead an enemy into dropping their guard. Distracting an opponent requires a Willpower task roll against the Willpower of the opponent. If the distraction is successful, the next attack against the distracted opponent on the following round receives a +3 attack bonus. Using Willpower for distracting an opponent may seem counterintuitive. Wouldn’t Prowess or Perception seem more appropriate? Not at all. Distracting an opponent — whether in physical combat (such as a gunfight), psychic combat (such as a battle of wills), or in a social conflict (such as a marital dispute) — isn’t about how good you are in a fight or how good you are at noticing things. Anyone who has ever seen a talented stage magician at work knows that the real “trick” to most illusions is getting the audience to look where the magician wants them to look. In game system terms, that’s a classic Willpower vs. Willpower task roll. Additionally, one of the main reasons we added the distraction maneuver to Bulletproof Blues was to help characters with low physical attributes cope with combat. Characters with high physical attributes don’t usually need to resort to distraction. Characters with high Willpower, on the other hand, are exactly the type of characters that need to use tactics like distraction. As you know, damage in Bulletproof Blues is not dependent on “rolling damage”. A knife usually does the same damage, a pistol usually does the same damage, and so on. The exception to this is if the attacker has “expertise” with the attack and rolls particularly well on their attack roll: that grants an “extreme success”, the most common result of which is +3 damage. There are three reasons for this. First, rolling and counting handfuls of dice is time consuming. Sure, doing it once is no big deal, but over the course of a game session, with every player doing rolling and counting, rolling and counting, that small amount of time adds up. Since one of the primary goals for Bulletproof Blues is that combat should be fast, we decided to keep the damage for attacks consistent. Second, given the range of power levels for attacks and defenses in a typical Bulletproof Blues game, rolling for damage obviously wouldn’t work. Even a relatively small variation (rolling a d6, for example) would have game-breaking consequences. A small revolver would have a reasonably good chance at shooting through an armored car, while a bazooka would have a reasonable chance to bounce off of a police officer’s ballistic vest. That works for a more “four color” game, but not for Bulletproof Blues. Third, and most importantly, is that we don’t want Bulletproof Blues to be the kind of game where you just attack a tough opponent over and over and hope to get lucky. If the player characters are faced with an opponent that shrugs off their usual attacks, we don’t want the players to just fire away at the enemy doggedly until a lucky hit takes them down. That’s terribly dreary. Instead, an enemy that is too tough for their usual attacks should inspire the players to rethink their strategy. Perhaps the player characters need to use teamwork to combine their attacks and overcome the enemy’s armor. If the opponent is too tough for even that, then they should try some other approach. Can the enemy breathe under water? Does the enemy have some psychological weakness than can be exploited? Is the enemy vulnerable to a particular form of energy? In Bulletproof Blues, success should depend on the choices of the characters, not on dogged persistence and waiting for a lucky die roll. Unpredictability is undeniably part of what makes combat fun, and even a small unexpected bonus can add some zing to a fight. So we got to thinking: how could we add a very small amount of variability to the damage in combat without undermining the basic premises of the game and without slowing down combat? 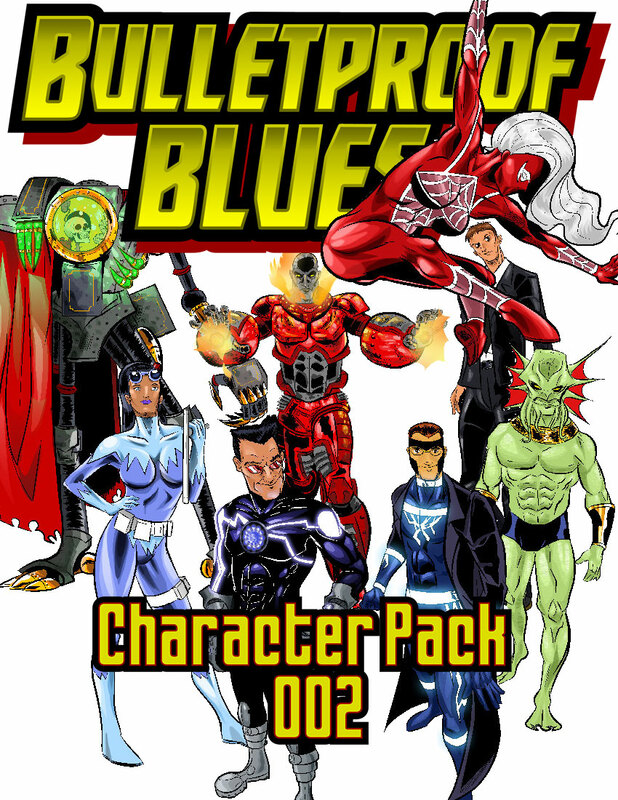 So here’s what we are currently planning for Bulletproof Blues Second Edition (look for the Kickstarter in February! ): an expansion of the benefits of rolling particularly well on a given task. Previously, a task roll either failed, succeeded, or resulted in an extreme success. We would like to add an intermediate step between ordinary success and extreme success, called “remarkable success”. If the player’s roll equals or exceeds the task difficulty, the character succeeds at the task in a completely satisfactory manner: the clue is found, the language is translated, or the lightning bolt hits its target. However, rolling higher than the required task difficulty may grant additional benefits. If the player does not have expertise in the power or skill, and rolls three or more over the task difficulty, the character achieves a remarkable success. So if a character attempted a challenging task (task difficulty 12), and the player rolled 15 or more, but the player did not have expertise, this would be a remarkable success. If the player rolls a remarkable success when making a skill roll, perhaps the character gets some small amount of additional information unrelated to the task at hand, or perhaps the GM gives the player a hint about a better avenue of inquiry. If the player rolls a remarkable success in combat, one rank is added to the weapon or power, solely for the purposes of that attack. If the player has expertise in the power or skill, and rolls three or more over the task difficulty, the character achieves an extreme success. So if a character attempted a challenging task (task difficulty 12), and the player rolled 15 or more, and the player had expertise, this would be an extreme success. If the player rolls an extreme success when making a skill roll, perhaps the character has a “eureka!” moment, or perhaps they have found answers to questions they didn’t even know they should ask. If the player rolls an extreme success in combat, the attacker may choose one of three bonus effects, unless the description of the power says otherwise: overwhelming the target, smashing the target, or staggering the target. One repercussion of adding “remarkable success” is that characters with very high Prowess or Accuracy can often rely on doing an extra point of damage with their attacks. Conversely, characters with very low Prowess or Accuracy will often take an extra point of damage from attacks. Fortunately, most of the replies were not so, ah… conservative? However, this made me think about Bulletproof Blues. Just because a setting doesn’t “embrace politically/socially progressive ideals” doesn’t necessarily mean that the game designers are unaware of those ideals or disagree with them. For example, the setting of Bulletproof Blues is a bit darker than our world. The corruption that results from institutionalized power is a theme of the game (not so much as you’d find in a cyberpunk game, and we try not to beat you over the head with it, but it is there). As a result, nearly every CEO and powerful non-superpowered figure is an old white guy. That’s deliberate, not because we (the authors) think that’s how things should be, or even how they are in the real world, but because that’s the kind of world Bulletproof Blues is set in. In the Kalos Universe, the real divisive issue isn’t race or gender or even money: those are just symptoms. It’s about power. In the Kalos Universe, the first priority of institutionalized power is to preserve itself. The general assumption is that the PCs will put themselves in opposition to this power structure. You don’t need to use any of this in your own game, of course. It’s your game, and you can play however you like. Chris Sims over on ComicsAlliance has written an interesting article about what he calls “The Problem” — DC’s envy of Marvel. Of course, like most such articles it completely ignores the pivotal role that Kalos Comics played during the Golden Age and Silver Age, but it is a fun and interesting read, nonetheless. Posted in Roleplaying Games	| Enter your password to view comments.